Celebrate community, country and delicious craft beer – all for a great cause! 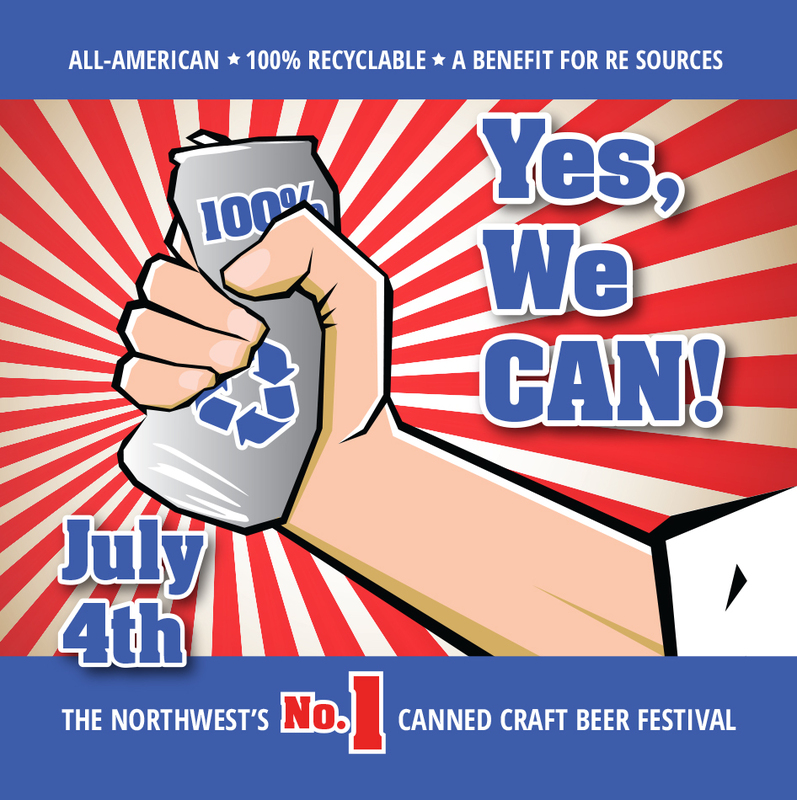 This Fourth of July, from 6 to 10 p.m., join in the fun at the Yes We, CAN! Canned Craft Beer Festival to celebrate community, country and delicious craft beer – all for a great cause. Held on the 1400 block of W Holly St in Bellingham (outside of Elizabeth Station, beer retailer and taproom), this event will feature more than 40 breweries, cideries, and meaderies. There will be music from Bluegrass and Americana-stomp bands Polecat and Wild Rabbit, live performances from the Bellingham Circus Guild, RE Store games for the kids, street food, and one of the best views of the fireworks show in town. Tickets are only $20 in advance ($25 at the door), and admission includes 3 drink tickets. Kids 14 and under get in free. The RE Store is hosting this family-friendly 4th of July festival because we care about waste and recycling. This event is about changing consumer perception of canned beer, and raising awareness around packaging choices. Aluminum cans, when recycled, are a superior packaging option for beer – one of the most largely consumed products in America. Aluminum cans contain a higher percentage of recycled materials, require fewer fossil fuels in the recycling process and transportation, and are infinitely recyclable. We want shoppers to think more carefully about the source and destination of the packaging their goods come in. And we want to have fun while doing it. RE Sources & The RE Store are responsible for the adoption of curbside recycling in the state of Washington thirty years ago. The RE Store was founded ten years later to divert the #1 source of landfill waste into a usable or recyclable commodity. It’s part of who we are to constantly think of new ways to conserve more, reuse more, and recycle more. This festival is about getting people to stop and think – the container around that beer you’re drinking? – it matters. Buy tickets online at universe.com/yeswecanbeerfest or around Bellingham at the Community Food Co-ops, Kulshan Brewery, Elizabeth Station or The RE Store. For more information, visit re-sources.org/yeswecan. Or, volunteer for free admission! We need over 150 fun-loving helpers to make this event a success. Volunteers receive free admission (which includes three tickets for 5.5 oz beer tastings, root beer floats, or food and entrance to a great concert), a RE Store t shirt, and a perk packet of discounts and gift certificates to businesses around town (Backcountry Essentials, Aslan, Kulshan, Nuu-muu, The RE Store and more!). Get in free, have a ball, and help RE Sources continue to protect and empower our community. Register now! If you have questions, contact Jen Castaldo, jencastal[at]gmail.com, or call (360) 961.1957. All proceeds benefit RE Sources for Sustainable Communities. Thanks so much to our sponsors: Alcoa, RDS, Bellingham Tap Trail, Puget Sound Benefits, KISM, The Adam Vwich Agency, Nuu-muu, Community Food Co-op, Ball Corp, Kulshan Brewery, Aslan Brewery, Muds to Suds, NW Recycling, Rice Insurance, Johnson Team Real Estate, Backcountry Essentials, Boundary Bay Brewery, Mt Baker Experience, Bellingham Herald, Village Books and Elizabeth Station. Cans are impervious to the damaging effects of light and they are hermetically sealed leaving little air space inside, preventing oxygen from damaging the beer. Cans have an aqueous polymer liner that locks in flavor and keeps the beer from coming in contact with aluminum. 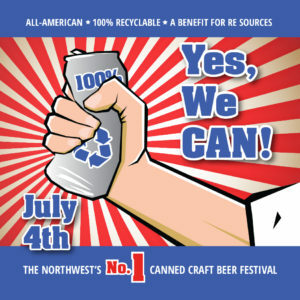 Cans are 100-percent recyclable and made up of more recycled content than glass or plastic. They do not break, and crush easily making them easier to recycle — and can be recycled indefinitely. They are lighter and use less packaging material, requiring less fuel to ship. Cans do not break, so they’re safer than glass, and they are lighter and more compact for packing in coolers, and in-and-out of outdoors. They chill quicker too.